Armed with synthesizers, laptops, software and their own friendship Ascendant conjures a private sonorous world. 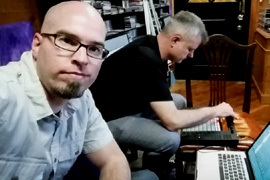 In an attempt to transcend language, Electronic Musicians Don C. Tyler & Chris Bryant make music remarkable for the power summoned from subdued shades of sound. The quietly exhilarating Meridian (86'57") welcomes the listener's thinking. These 10 deeply felt meditations of the mind are held within a meticulously detailed, gorgeously rendered music - which transfers their ideas past our ears and into our own thoughts and dreams. Dark days prime Tyler & Bryant for vivid sights of night, as electronic sound itself becomes a refuge. The pulse of their electro-arpeggio slowly soars, jumps and dives quite pleasurably in tender and deeply invested arrangements. Thinned out sonic pigments, from a palette of creamy purple tones, and abstract forms from a mysterious private realm, provide a particular etherized beauty. Beds of plangent electronics amidst fields of pink and gray, plus a wealth of amorphous soothing shapes, make Meridian seductive and velvety - while its slow shuffling sequencer patterns insist you give it more time. Ascendant's cerebral notions of resolute motion act among vague forces and forms. Their thoughtful harmonies from electrically charged strings empower agile basslines and vaporous keyboards. Pastel colored moods help Meridian dither in aestheticized reverie, making your place in space so very lush. From its barren vacancy and atmospheric effects to grace notes of concord, Meridian delivers more to the listener than the musicians ever intended. 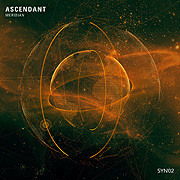 Ascendant signals their individuality by rejecting what is popular, for us to simply savor their aural splendor. This album is a Spacemusical joy.